Uttarakhand High Court has released notification for the recruitment of Ministerial Staff (Clerk & Stenographer) in Subordinate Judiciary Uttarakhand 2014. 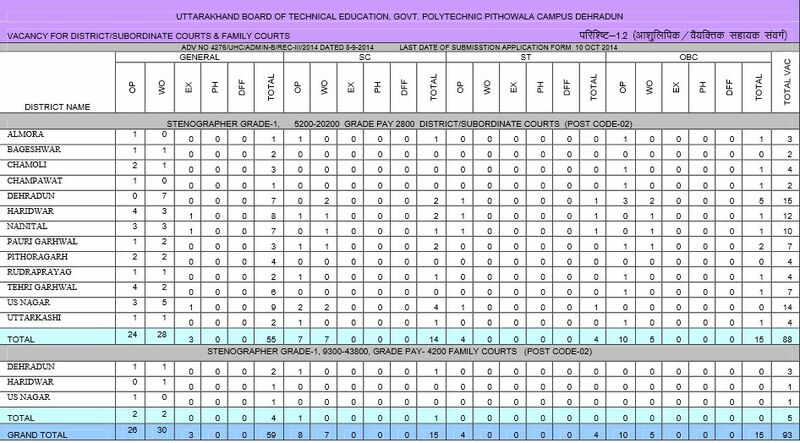 Under the advetisement on High Court website www.highcourtofuttarakhand.gov.in and UBTER website www.ubter.in , total 270 vacancies of Clerk and Stenographer are to be filled by Uttarakhand Subordinate Judiciary Clerk Grade Exam 2014. UBTER invites application for the post of Clerk and Stenographer in Uttarakhand Subordinate District Civil Court and Family Court. Interested candidates can apply to one or both posts (separate application) in a prescribed format given below. Graduate with good knowledge of English & Hindi and working of Computer. 1) For Clerk – 7500/hr Key depression speed in Hindi to qualify. In case of equal marks/age, then priority will be given to 9000/hr depression in English. 2) For Stenographer – Hindi Steno 80 words per minute AND 7500/hr Key depression speed in Hindi to qualify. In case of equal marks/age, then priority will be given to 9000/hr depression in English. Note : Please do not send any documents with application form. Help us to improve this article/job posting "270 Clerk / Stenographer Vacancy in Uttarakhand Courts". We would be glad if you can comment below and provide your valuable suggestions and feedback. If this page have any wrong information/list or out of context content, then you can report us as well. Delay in providing joining letter to selected candidates. We are waiting for joining letter of clerk & steno exam. This is my roll no. but joining letter is not provided by Ubter. I don’t know why? Kindly provide us joining letter. we can’t wait any more. UBTER Made too much delay in providing joining letter. We should apply PIL in high court. Topper of steno exam in subordinate court. but not received joining letter 2 months have been passed. what’s the problem to provide joining letter to sucessful candidate. already one year passed away. Kindly published in newspaper why the UBTER making dealy in proving joining letter to ministerial staff exam’s candidate. Reject all the joining if you not failed to provide joining letter. 25 exam given by me in UBTER board but when i selected that time they are not providing joining letter. I have made call on ubter office no. in dehradun but not one is giving information about the dealy. I am also waiting for joining letter. my roll no. is 18826049. do you people have any idea about approx joining date. if you receive your joining letter then kindly contact on my email id- sunil39negi@gmail.com. any body of you receive joining letter pls inform me on my email id beenabisht569@gmail.com. my roll no is 15501181.
any one idea about when we will make joining. please send any information related to joining process pls send on my email id sanoj_kumar21@gmail.com. i dont have any idea about joining. frnds if you gets any news pls plse plse infom me urgently. you people know joining file of ministerial staff is available in high court of nainital.it’s clearly written in exam result of ubter site. congrats all friends who have qualified the ministerial staff exam. it’s good we are becoming part of district court & family court. but i have not received joining letter. one of my friend who is working in family court of haridwar he is saying joining may take 2 months time. but more than 2 months time passed away. no one providing information about joining letter. where i have to make contact if i don’t received joining letter. please help. 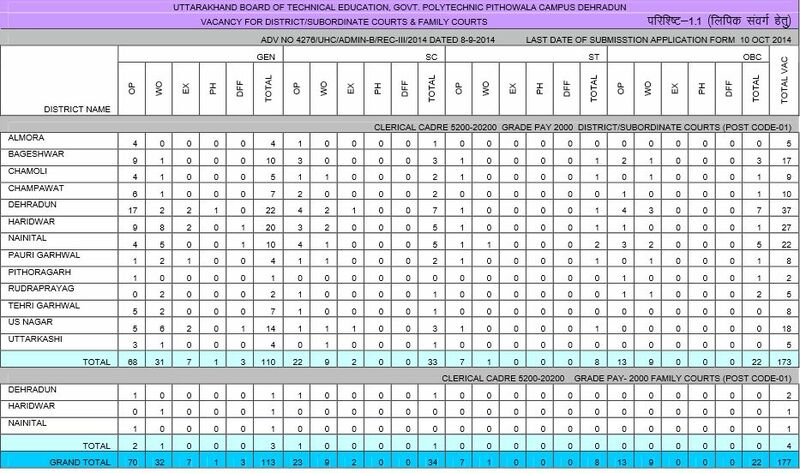 any one idea about what is the approx joining date of first phase selected candidates…..
you have got 70 rank in this exam we are three people who have also selected in this exam. we all share necessary information all about the late joining process. If you want to get information with us then kindly write down you mobile no. here. wait i will provide u some valuable information about the issues. I am very much disappointed that haven’t got the Joining date yet. And it feels like hell to sit at home doing nothing, just waiting for joining date. Please somebody suggest. What should we do? I understand manoj ji you are much worried about joining.you are also connected with me via phone.Please note down my cell phone no. also to get connected with us. my no. is 9911719048. I request to all my friend pls make a call on my no. or my friend manoj no. so that we can make plan for what we should do ? I missed this opportunity. But I have confidence that next time I achieve this opportunity. Sir may you tell me about this when will come the next vacancies. When come the next vacancy for the uttrakhand high Court lipik?